Get solar incentives for your business, non-profit organization, or multifamily property. Generate electricity from the sun! Cash incentives are available to businesses, nonprofits and multifamily residential property owners that install eligible solar electric systems. The incentive program is managed by San Francisco Public Utilities Commission and supports installations located in San Francisco. 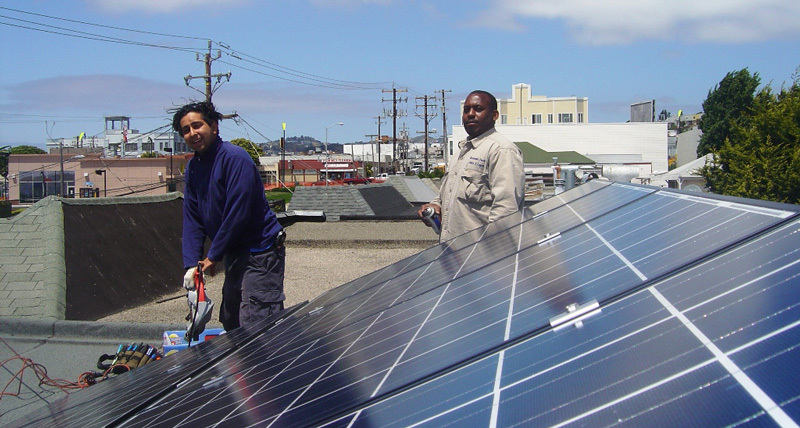 Cash incentives are available to owners of qualifying multifamily affordable housing properties that install solar electric systems to offset energy used in common areas and in tenant residences. The incentive program is managed by PG&E for properties in San Francisco. Cash incentives and other support are available to homebuilders that construct new, energy-efficiency solar homes. The incentive program is managed by the California Energy Commission. Businesses that install solar electric systems may qualify for a credit against federal taxes owed. The tax credit is valued at 30 percent of the net system cost for systems placed in service by December 31, 2019. Businesses that install solar electric systems may qualify for a deduction from their taxable income on their federal tax returns. The tax deduction is achieved by depreciating the net system cost using the five-year depreciation schedule. Systems placed in service by December 31, 2017 can receive a 50% bonus depreciation in the first year, resulting in a total tax savings value of up to 25 percent of the net system cost. Cash incentives are available to businesses, nonprofits and multifamily residential property owners that install eligible solar water heating systems. Incentive amounts vary based on the expected energy savings. Owners of qualifying multifamily affordable housing properties that install solar water heating systems to offset energy used in common areas and in tenant residences may qualify for higher incentives. The incentive program is managed by PG&E for installations in San Francisco. Businesses that install solar water heating systems may qualify for a credit against federal taxes owed. The tax credit is valued at 30 percent of the net system cost for systems placed in service by December 31, 2019. Businesses that install solar water heating systems may qualify for a deduction from their taxable income on their federal tax returns. The tax deduction is achieved by depreciating the net system cost using the five-year depreciation schedule. Systems placed in service by December 31, 2017 can receive a 50% bonus depreciation in the first year, resulting in a tax savings value of up to 25 percent of the net system cost.